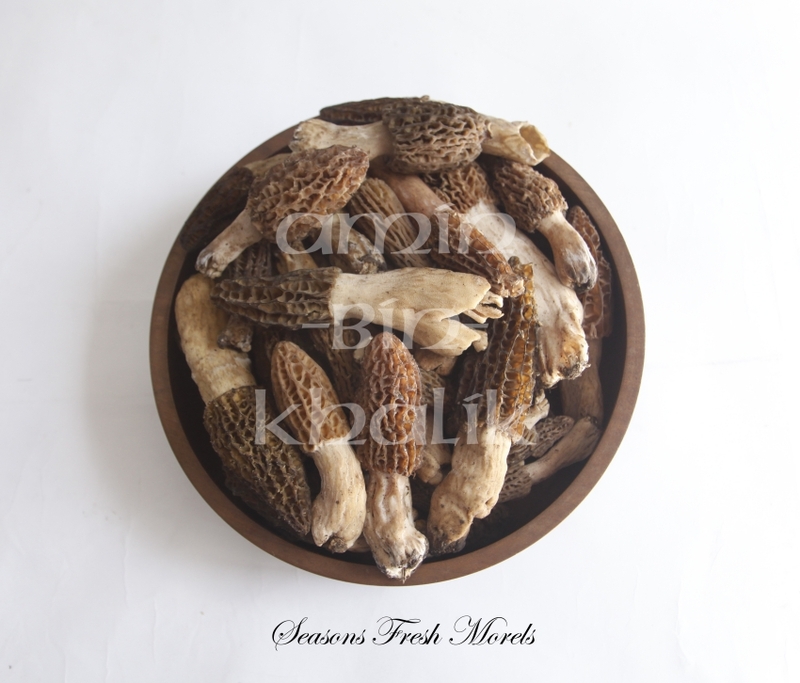 Fresh Morels from Kashmir - New Crop Morels, Wild Dried Morels online|ABK® Buy Worlds Best Saffron, Walnuts, Acacia Honey, Morels & more! Spring Yield - Season's new crop of Morels from Kashmir! Morels start appearing from early spring and are the most sought-out spring mushrooms in India and worldwide. The morels are highly appreciated for their culinary aspects and gastronomical delights and excellent flavours. With the onset of Spring Morels start appearing widely in the woods of Kashmir valley and NW Himalayan range with the black ones, Black Morels to appear first followed by yellow morels. This spring in Kashmir we had just about the worst season since many many decades as Morels started to disappear from regions where they often showed. Perhaps their disappearance is linked to the Global warming with temperatures scaling up year after year in Kashmir with scanty snowfall in the recent winters we have had. Amid of all this, we have ensured that the best Morels sell here, at ABK. Fresh Morels are big and soft and are highly perishable; they can, however, be preserved by washing them properly, flouring them and then let your fresh morels freeze. When frozen fresh Morels are to be reused they should be fried directly and not thawed and then fried. The best strategy of preserving morels is to dry them and once the drying process starts with morels, they cannot be let to go moist again - unless when to be used, else they will rot. Drying Fresh Morels takes a few days and removes all the moisture from them and they are reduced to 10th of their weight as when they were fresh - 1000 gm of Fresh morels gives just about 100 gms of dried ones. Once morels are dried properly they would last for years. The best way to store your dried morels is to put them in an airtight glass container and they would last for years. Dried morels can also be turned to mushroom "dust" by placing them between sheets of waxed paper and crushing them with a roller. The resulting powder makes a great base for sauces and soups.